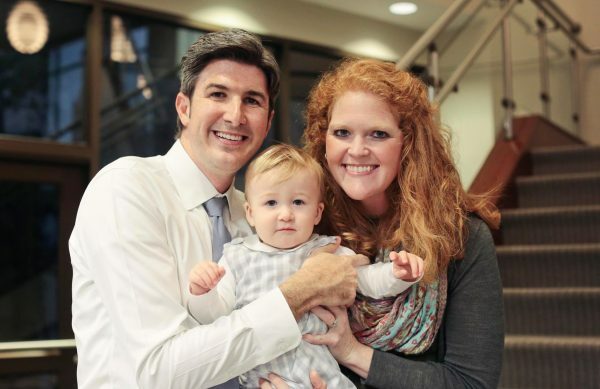 Josh and Laurie Fleming with their son, Garrett. Although they are both Mississippi natives and Ole Miss graduates, the two never directly crossed paths until they began working together. Laurie, a clinical associate professor of pharmacy practice, completed her Pharm.D. and pharmacy residency in the state before joining the school’s faculty in 2010. Josh, a clinical assistant professor of pharmacy practice, had stops at the University of Tennessee, Campbell University and Johns Hopkins University. He met Laurie when he moved to Jackson to work at the School of Pharmacy in July of 2012. The two began dating after getting to know each other better through friends from church. Laurie saw many positive qualities in Josh that continue to inspire her – he sees the best in others, gives the benefit of the doubt and is never judgmental. Josh was immediately attracted to Laurie’s kind personality, saying she is a good partner for him because she helps him better understand people from an emotional standpoint. 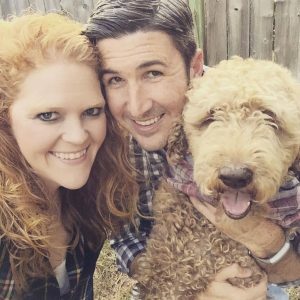 After dating for about eight months, Josh set out to propose with some help from their labradoodle, Wrigley. Laurie and Josh Fleming with their labradoodle, Wrigley. After three years of marriage, the couple enjoys spending time outside, traveling to new places, eating well and, of course, watching their 17-month-old son, Garrett, grow up. They don’t let work get in the way of those precious moments. Laurie and Josh aren’t the first married couple in pharmacy, and they likely won’t be the last. They both agree that to make it work, couples have to make an effort to get away from the world of pharmacy. Laurie said that trips and friends outside of the profession have expanded their horizons. Josh agreed, but knows that working together can be an advantage.